I like that it feels and actually looks more like a lipstick but with the ease of a balm and gloss in one. This lip balm is very pigmented. 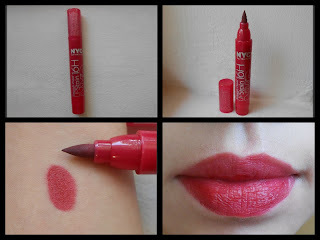 It has a sheer color that brightens up my natural lip tone and it leaves a nice red tint. Inexpensive yet a quality alternative to the more expensive lip balms, lip butters, etc. I like this. The apple lip balm center and color surrounding it is a cute design, and they are really moisturizing. I don't need any other lip balm before using or alongside them. I like that if it has any flavor I can't taste it. It's packaged so you can toss it in your purse and go. Though the color faded fast, it kept a lip tint effect on my lips throughout the entire day and kept my lips nice and plump. It has a nice appley smell. I will say the color lasts about 1 or 2 hours. This is a Great spring/summer and affordable product! I have no idea why I have never tried these before! It has amazing pigmentation (so dark!) and it stays on for a long time. 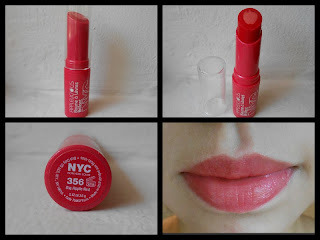 It is more moist than the others lip stains I have tried before, matte finish. It has a good staying power, I would say not really 16 hours but I applied it at 8:30 a.m. and when I got home around 5:00 p.m. I could still see a hint of it. This lasted through a meal and drinking. Smells fruity. It layers to a very vibrant color, but a few swipes provide a perfect glowy fuchsia-red/pink. Let it dry for 30 seconds, throw some lipgloss or balm over it and you have a nice color that does last for a number of hours. I love the sharp point that makes outlining the lips a breeze, no lip pencil needed. It's perfect for your beach tote or purse and is easy to apply, zero transferring and the price cannot be beat. If you store your lipstain marker standing up it will keep the ink in the bottom and will keep it from drying out.